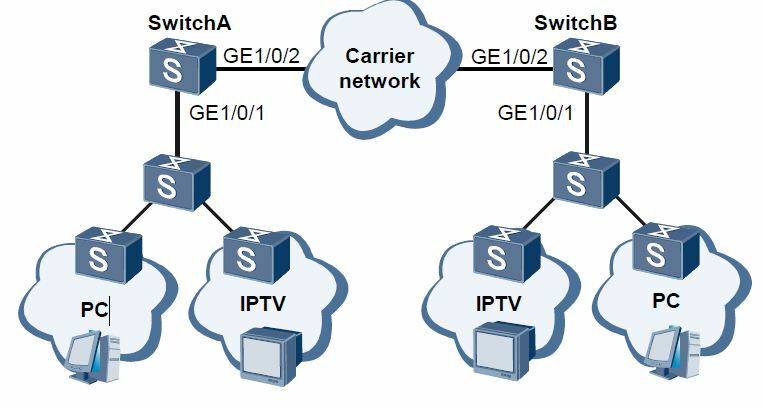 As shown in Figure, common Internet access users (using PCs) and IPTV users (using IPTV terminals) connect to the carrier network through Switch A and Switch B and communicate with each other through the carrier network. It is required that packets of PCs and IPTV terminals are tagged VLAN 2 and VLAN 3 when the packets are transmitted through the carrier network. 1. Create VLANs on Switch A and Switch B. 2. Configure types of interfaces on Switch A and Switch B, and add the interfaces to corresponding VLANs. 3. Configure selective QinQ on interfaces of Switch A and Switch B. # On Switch A, create VLAN 2 and VLAN 3, that is, the outer VLAN IDs added to packets on the carrier network. # On Switch B, create VLAN 2 and VLAN 3, that is, the outer VLAN IDs added to packets on the carrier network. Step-2: Configure selective QinQ on interfaces of Switch A and Switch B. # Configure GE 1/0/1 of Switch A. # Configure GE 1/0/1 of Switch B. # Add GE 1/0/2 of Switch A to VLAN 2 and VLAN 3. # Add GE 1/0/2 of Switch B to VLAN 2 and VLAN 3. # View the configuration of each interface on Switch A. #View the configuration of each interface on Switch B. * PCs can communicate with each other through the carrier network. * IPTV terminals can communicate with each other through the carrier network.